Claire Conceison. 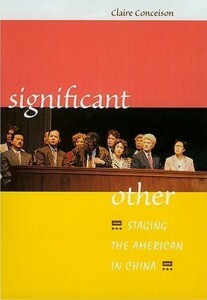 Significant Other: Staging the American in China. Honolulu: University of Hawai’i Press, 2004. 297pp. ISBN 978-0-8248-2653-6, cloth $55.00. Since the mid 1990s, Claire Conceison has provided insightful reports of some of the most riveting development of Chinese huaju (spoken drama), often mixing her unique experience as an insider to the professional theaters in Beijing and Shanghai with provocative analysis on well-grounded historical and theoretical footings. 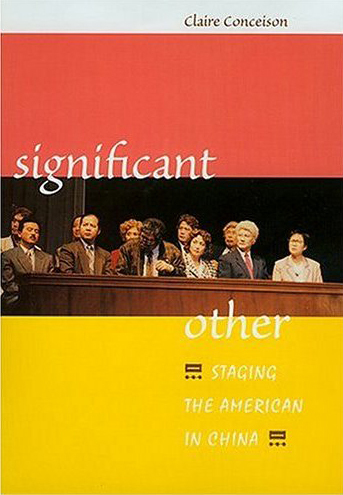 All these traits are present in her book Significant Other: Staging the American in China, in which she offers a fascinating reading of Chinese nationalism in the 1980s and 1990s through its theatrical construction and representation of the Western, particularly American, Other. In a highly personal and readable manner, Conceison deftly examines seven huaju plays staged between 1987 and 2002, combining first-hand observations and interviews with script and production analyses based on the theoretical framework of Occidentalism. The result is a cultural history that will benefit a wide range of readers, most of all students and scholars of Chinese studies and theater studies. The book can be roughly divided into two parts. The first part, which includes the prologue and the first two chapters, sets up the framework for her project on three levels–personal, social-historical-theatrical, and theoretical. The second part–chapters 3 through 8–is devoted to the examination of plays, with approximately one play per chapter. Conceison begins her book by accentuating and problematizing her own experience in China as an American, “a privileged marginalized Other rather than a dominated colonized object” (3)–in other words, a significant Other. This twist on Frantz Fanon’s colonized Other of “black skin, white mask” provides her with a unique angle with which to observe rising Chinese nationalism and its historical and contemporary representation of both its own minority and Western Others, a topic she discusses more extensively in Chapter 1, “Setting the Sino-American Stage.” In providing a historical background of China’s relationship with the West, she engages both Faribank’s formulation of modern Chinese history as “response to the West” and the more China-centered historical view of his critics. In the end, her analysis is grounded in her direct engagement with Chinese theatrical artists: “I examine the development of Chinese spoken drama in the past fifteen years by considering the perspectives of those creating it, through the lens of their construction of images of the American Other as part of a fluid and dynamic process of continually repositioning themselves vis-à-vis this ‘significant Other’ in response to various domestic and international artistic, political, and material stimuli” (27-28). It is indeed Conceison’s ability to tease out how the productions responded to these stimuli that makes her book such an invaluable social history of this period. Also in Chapter 1, Conceison identifies two categories of analysis that she employs throughout the book: a politics of identity and a politics of location. She uses “a politics of location” to examine the exilic experience of Chinese in America (or occasionally Americans or Chinese-Americans in China) in these plays with the help of Una Chaudhuri’s usage of geopathology–“the construction of identity as negotiation with the power of place” (35). Ultimately, though, these experiences were staged for domestic Chinese consumption, either reinforcing a stereotypical image of America or introducing subversive social and political commentary. Conceison examines “a politics of identity” on two levels–practical and theoretical. On the practical level, she considers the physical representation of an American character, by either a Chinese actor or an actual foreigner. As made clear in her subsequent analysis, these visceral images often played significant roles in shaping the directions of a production. Chapter 2 “Occidentalism (Re)considered” is reserved for the theoretical discussion of politics of identity, where she constructs the framework of Occidentalism. First Conceison engages previous attempts to define the term, in relation to Said’s Orientalism, by Xiaomei Chen, James Carrrier, Frank Dikötter, Eugene Eoyang, among others; she then offers her own model. Basing her strategy in part on the Faoucaultian notion of discursive temporality, she refuses to limit Occidentalism to a “tightly woven, all-encompassing, controlled formulation” (54) of reverse Orientalism. Instead, she calls for a model that is “(1) paradoxical (or contradictory/dialectical) in character and function; (2) existing in both paradoxical relation to and continuous dialogue with Orientalism (and other discourses); and (3) open-ended, changing, active, and self-consciously temporal” (54). As borne out by her analysis in the second half of the book, this approach is essential to understanding the shifting surfaces of these Chinese theatrical productions during a particularly sensitive period in China’s relationship with the West. The second part of the book is devoted to analysis of seven huaju plays, written and performed from 1987 to 2002, that present America as a significant Other in location and identity. These plays include Zhongguo meng (China dream, 1987), which is discussed in Chapter 3, “Immigrant Interculturalism”; Da liuyang (The great going abroad, 1991) in Chapter 4, “Exilic Absurdism”; Niaoren (Bird men, 1993) in Chapter 5, “Cultural Cross-Examination”; Peidu furen (Student wife, 1995) in Chapter 6, “American Self-Representation”; Zunyan (Dignity, 1997) andQie Gewala (Che Guevara, 2000) in Chapter 7, “Anti-Americanism”; and Qiuqian qingren (Swing, 2002) in Chapter 8, “Self-Occidentalism.” Staged roughly two years apart from one another and spanning a fifteen-year period, each of these plays represent a rather unique moment in Chinese nationalism and China’s relations with the West, especially America, as defined by such events as the 1989 student movement, the 1999 NATO bombing of the Chinese Embassy in Yugoslavia, and the 2001 U.S. spy plane incident. These events changed the Chinese sentiment towards the U.S. from adoration in the 1980s to hostility in the 1990s, as reflected in the productions of these plays. Coincidentally, these plays also mark the evolution of huaju ‘s representation of Westerners from using heavily made-up Chinese actors to employing (often amateur) Western actors who speak Chinese. Conceison’s insider’s knowledge of the production processes gives her tremendous insight into how the “othering” subject comes to represent the “othered” object. It is important that the medium through which Conceison examines Occidentalism is a theatrical one, where phenomenological presentation is concrete and the mise-en-scène–the actor’s body, makeup, costume, set, music, lighting–is unavoidably shaped by the choices made during production. Because of the importance of physical representation, Conceison considers it a milestone when in 1995 an American actor and a Polish actress were hired to play an American couple in Student Wife, a break from the previous practice of using Chinese actors with heavy “realistic makeup” (xianshi huazhuang). As the person who introduced the American actor Robert Daly to his Chinese director Yu Luosheng, Conceison documented how this change in casting practice not only allowed the American self-representation but also gave Daly a chance to persuade Yu to reconsider his racially stereotypical choices in portraying the Jewish wife. Conceison also shows how this American self-representation can be a double-edged sword. The often amateurish nature of these foreign actors, chosen mostly for accessibility and fluency in Chinese, creates a tradeoff between professionalism and presentation. In extreme cases, this self-representation further turned into self-Occidentalization, as revealed by Conceison’s scathing analysis of the role that another American actor, Matt Trusch, played in the 2002 production Swing . During the rewriting and rehearsal process, Trusch added lines and background stories for his character that not only altered the focus of the play but also ended up simplifying his character and reinforcing the American stereotypes. If there is one area in which I wish Conceison could have spent more time, it is the historical context of huaju‘s performance of foreigners. Arthur Miller discussed the issue of using wigs and beards in performing American characters–and noted his strong objection to the practice–in Salesman in Beijing, a book about his directing of Death of a Salesman in 1983 for the Beijing People’s Art Theater, the same theater that staged Bird Men. Given her unique position as an insider with close ties with the theater, it would have greatly benefited her readers if Conceison had offered some discussion on the impact of Miller, and subsequent Western directors such as Charlton Heston, who directed The Caine Mutiny for the same theater in 1988, on the Chinese representation of Western Others. Performance genealogy might also help contextualize the staging of Jewish characters, which Conceison discusses extensively in Chapter 6, in relation to Student Wife. Both Daly’s vocal protest during rehearsal and Western audience members’ negative reaction in post-performance talkback sessions compelled director Yu Luosheng to drop all anti-Semitic representation of the American wife Lucia. While Conceison sees this as laudable progress, she also points out that the elimination of her background leaves Lucia’s unsympathetic traits unexplained (142-43). The Chinese director’s inability to stage a nuanced racial representation is similar to the dilemma facing the 1980 Beijing production of The Merchant of Venice. According to Ruru Li’s report of the production, the director “eliminated or played down references to the hatred between Jews and Christians, emphasizing instead the conflict between greed and mercy.” This elimination provoked criticism that the production greatly simplified Shylock’s character, a reaction that Conceison somewhat echoes in her discussion ofStudent Wife. Among other issues, these two productions point to a major hurdle for Chinese directors in their staging of Western Others–their limited exposure to life in the West, which Yu Luosheng freely admits in his interview with Conceison. Citing examples such as the The Merchant of Venice production could have further contextualized and accentuated this issue. Conceison is obviously mindful of her two major reader groups, from the fields of Chinese studies and theater studies. The former will probably find Chapter 2 the most helpful because of its useful summary of the Occidentalist discourse, while the latter might be more interested in the second half of the book, for the in-depth production analysis. In fact, Conceison even gives permission to those uninterested in the Occidentalist discourse to skip Chapter 2 (30). However, both groups–and other general readers–will be well-advised to read the book as a whole, since the two parts are integrally related. Conceison’s production analysis often offers concrete examples of the interaction between social, cultural, and political issues in contemporary China, while her examination of the Occidentalist discourse provides a good tool for understanding and analyzing postcolonial issues in literary works and theatrical productions that are not limited to China. Ruru Li, “The Bard in the Middle Kingdom,” Asian Theatre Journal 12, no. 1 (1995): 66.